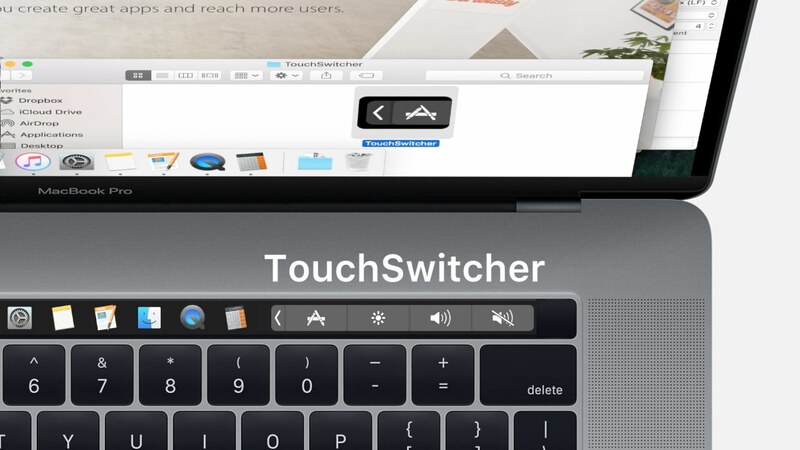 Use this Touch Bar app to launch and switch between apps on the new MacBook Pro. The most recent apps are right next to the TouchSwitcher icon. Juggling several apps is fast and easy. Forget the Dock and tap on app icons directly. Faster than ⌘Command + Tab and Dock? Only one way to find out! Tap TouchSwitcher icon in the system Control Strip to show the app list. You can also use customizable Option + 9 shortcut. Favorite apps are shown to the left of running apps. There’s an option to hide favorite apps and reveal them by swiping left instead. Hide, Quit and ☆ (to mark an app as favorite). Shift-Tap app icons to quickly hide multiple apps. Option-Tap app icons to quickly quit multiple apps. Change the shortcut, quit TouchSwitcher or set per-app overrides. Click “Touch Bar Settings…” button to force showing F1, F2, etc. keys for certain apps. Press and hold TouchSwitcher icon in the Touch Bar to hide it. Only one custom control can be shown in the Control Strip. Use the keyboard shortcut to bring back TouchSwitcher icon if other apps (like Safari, iTunes or Xcode) displace it. You can encourage TouchSwitcher development by giving gratuity or checking out my HazeOver app below. It supports the Touch Bar as well! Watch app demo video. Apple, the Apple logo and MacBook Pro are trademarks of Apple Inc., registered in the U.S. and other countries. MacApp Store is a service mark of Apple Inc.